The 2018 Audi TT, in the third year of its third generation, is a sophisticated all-wheel-drive sports car with the right stance, styling and handling. It’s quick and nimble when it needs to be, and relaxed at the right time. It’s called a four-seater, but it’s more like a 2+2 Coupe, or a Roadster with small shelf in back. 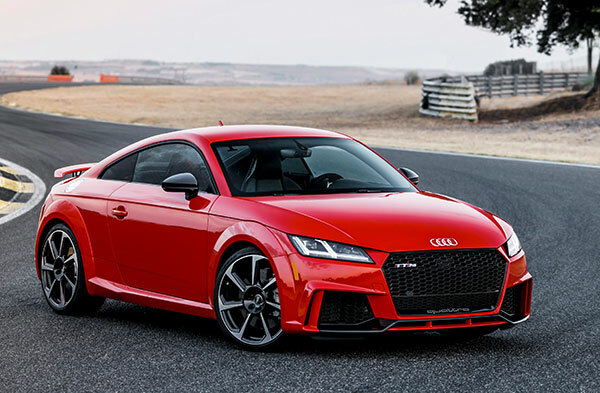 For 2018 there is a new model, a hotrod called the TT RS, packing a 400-horsepower turbocharged five-cylinder engine under its hood and a paddle-shifting 7-speed dual-clutch transmission. The RS rides lower, corners on a magnetic suspension, stops with 14.6-inch front brake discs and 8-piston calipers, and its quattro all-wheel-drive has been tuned for the mission. It accelerates from zero to sixty in a phenomenal 3.7 seconds, as quick as any old 600-horsepower V8. The standard Audi TT engine is a 2.0-liter turbo four-cylinder with direct injection, making 220 horsepower and 258 pound-feet of torque, mated to a 6-speed S-tronic dual-clutch transmission. Audi basically invented the dual-clutch, which has the gears of a manual transmission, but acts like an automatic, only sharper. The TT accelerates from zero to sixty in 5.3 seconds, quick enough to be thrilling. The Audi TTS adds boost to the turbo four to make 292 horsepower and 280 pound-feet of torque, accelerating to sixty in 4.6 seconds, a thrill and a half. The TTS gets a magnetic suspension, bigger brakes and cooler wheels. The TT is EPA-rated at 26 miles per gallon Combined, the TTS gets 25 mpg. The quattro all-wheel drive is the Haldex clutch-pack system that’s front-wheel-drive based, and responds to not only acceleration and traction but also steering inputs from the new variable ratio rack. The TT also has Audi Drive Select, with modes that allow the drive to select the level of response from the throttle, transmission, steering and stability control. For the 2016 redesign, Audi developed a new body structure with a low center of mass, using high-strength steel in the floor and firewall to supplement the aluminum that saves weight. A rearview camera comes standard. Active safety features are available, including the system that’s intended to keep the car in the absolute center of its lane. We find lane-keeping assist features bothersome. The Audi TT comes as a coupe or roadster. Audi TT Coupe ($43,950) and Audi TT Roadster ($47,450) come standard with automatic climate control; tilt/telescoping steering column; power features; ambient interior lighting; leather; 12-way power front seats with heating, Audi’s MMI infotainment system; Audi’s virtual cockpit programmable instrument cluster; a nine-speaker audio system; HD and satellite radio; Bluetooth; keyless entry; a rearview camera; front and rear parking sensors (new for 2018); a drive mode selector; automatic LED headlights; LED taillights; an adaptive rear spoiler; and 18-inch alloy wheels. A Technology package for the TT and TTS features a Bang & Olufsen surround-sound audio system with 12 speakers and 680 watts of power, navigation, blind-spot monitors, a smartphone interface, and Audi Connect wife hotspot capability with access to apps, social media, and weather, fuel prices, and other information. The Audi TT has been around more than 20 years, and in that time has evolved from round and funky to round, sleek, and powerful. From cute to awesome. Others have evolved toward roundness, because it is aerodynamic. So the first funky TT was a pioneering leader. Maybe not iconic like the upside-down-bathtub Porsche, but still distinctive. The TT has tucked-in overhangs and softly chiseled edges. It looks like a smaller version of the sensational R8 supercar. Its shoulders and creases, but especially its face, the wide-mouthed black grille, LED matrix headlamps. The cabin feels radical, with a swoopy padded dash that envelopes the driver and hangs over the passenger’s legs like an aircraft wing. The whole cabin feels aerospacey. You can find jet engines in the round vents on the black dash panel, for example. If you’re looking for them. At the center of the vents are climate control buttons that press and twist. The piped-in sound track from the engine reminds you it’s not a jet. The cabin materials bring you up to first class, they are high quality, goes without saying with Audi. The interior is purposeful, functional, and roomy (for a sports car) in front, with decent legroom and good adjustability in the driver’s seat. The front seats have good lateral support for the thighs and good bolstering for the back. In the coupe, the rear passengers’ legs will be buckled and heads might hit the hatchback glass. The interface is Audi Virtual Cockpit, using a 12.3-inch high-contrast screen displaying three different gauge layouts, including a performance version. The driver chooses his gauge display with a “view” button on the steering wheel. Most of Virtual Cockpit is controlled or not by voice command, steering-wheel switchgear, and a touch pad on the center console for MMI. A Navigation Plus package adds Audi Connect, with an embedded LTE data connection and Google Earth map displays, as well as Facebook- and Twitter-integrated interfaces. It also offers a search function that lets you input free text, scanning everything from navigation destinations to phone contacts to songs to podcasts. Virtual cockpit offers passengers no physical control over audio or other functions. But there’s always voice command. Good luck with that. The cabin materials and trim are bold, for example the flamboyant Express Red or Palomino Brown leather to choose over plain black or gray. There’s also Alcantara faux suede. The available S line package has diamond patterning on Nappa leather, and a lighting package enhances the interior’s ambience with accent lighting. The trunk in the roadster is quite small at 7.5 cubic feet, but the coupe has a decent 12.0 cubic feet. The chassis is aluminum and steel, a design in pursuit of good handling, and the TT comes out fairly nimble and balanced. The progressive steering with variable ratio and variable electric assist allows quick flicks in switchbacks and mountain hairpins, while contributing to stability on the freeway. However road feel is a bit lacking. The handling is fairly balanced despite an a less-than-ideal design, with the engine extending forward of the front axle, making weight distribution 60/40 front/rear–nose heavy. With that limitation, it’s inevitable that the TT will understeer, when it’s being pushed in corners. The faster TTS uses a magnetic suspension that’s firmer than the TT’s while delivering a better ride on rough pavement. But still we want more road feel. At 75 miles per hour a rear spoiler rises from the deck. Audi says it generates 110 pounds of downforce at 155 mph, which means you’ll never feel it. But it looks cool. The TT RS is ready for the track. Its turbocharged 5-cylinder engine (Audi has a long history with winning five-cylinder racecars) makes a whumping 400 horsepower and 354 pound-feet torque, to get to 60 mph in 3.7 seconds using launch control to keep the tires from spinning. The larger engine actually puts more weight up front, but its power can be used to compensate for understeer. Quattro allows it. The available Dynamic Plus package for the RS includes carbon ceramic front brakes, and fixed dampers instead of the magnetic dampers. The fixed dampers are firmer and lower the stance. The package also includes a carbon fiber engine cover, and an electronic release in top speed to 174 mph from a mere 155. Track only please. The Audi TT looks great, handles well, and has a superb powertrain, with its 2.0 turbo available with 220 or 292 hp, take your pick. Or pick the new RS for another 20 grand, with an inline five-cylinder engine making 400 horsepower. We like them all, but especially the RS because it makes supercar power and speed out of a smaller engine and less weight.